"Fresh off 2018's collaborative LP with the enigmatic MF Doom, Czarface Meets Metal Face," the adventure continues as Czarface now faces off with Wu-Tang Clan's Ghostface Killah. Czarface Meets Ghostface brings strictly mind melting beats and bars as three emcees clash like villains & heroes in the Savage Land. 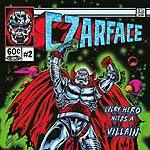 Czarface, a hip-hop & comics force comprised of Wu-Tang Clan General Inspectah Deck, Esoteric (who recently penned an X-Men comic for Marvel) and super producer 7L team up with Ghostface aka Iron-Man aka Tony Starks for murderous mayhem! Czar commando's Rebel INS & Esoteric trade lines such as 'follow in my footsteps might tear your Achilles,' & 'flow customized got that Dapper Dan touch' with Ghost on the assist 'chain is off the cooler, charm look like a shrunken head'. With track titles like 'The King Heard Voices', 'Mongolian Beef', 'Czarrcade '87', 'Masked Superstars' & 'Powers and Stuff' expect nothing short of a super charged collaboration! 12 brand new tracks produced entirely by The Czar-Keys (7L & Jeremy Page)"